Mario 10 Rubber Anti-Vibration Pad | Vibration Isolation and Shock Absorption for Washing Machines & Appliances. Made from compressed crumbed rubber particles, these anti vibration mats are commonly used underneath washing machines or other appliances, such as electricity generators and air conditioning units to dampen noise and reduce vibration, however they are incredibly versatile and can be used for almost any purpose imaginable; protective flooring for gyms or playgrounds, as an extra layer of insulation in greenhouses (when used as place mat for plants), or an anti-slip mat in trunks or cargo areas. They are also incredibly effective for home insulation, and are regularly used for flat rooves. Made from 100% recycled rubber granules, this material is extremely robust and weatherproof, and the roughened surface of the vibration isolators also provide firm support. With an anti-mildew additive, the durable and low-abrasion rubber mats are also suitable for damp rooms. 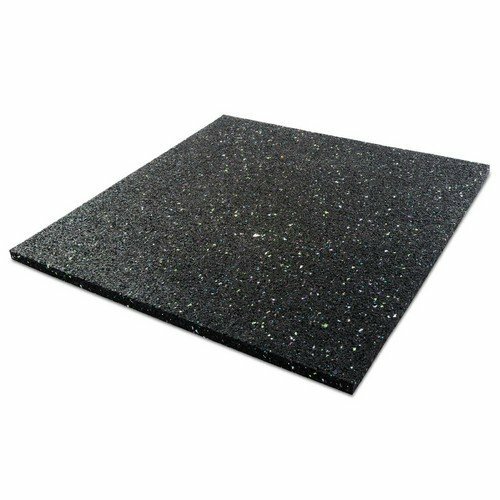 Can also be used as a safety enhancing mat for gym flooring or as an anti fatigue mat in the workplace, due to the soft granular rubber composition.